There are a couple of things I'm working on. The biggest one was the Burda 7938 Corset Bodice or whatever it's called. Light, flimsy or drapey fashions don't usually find their way into my closet because, well, I don't look good in them. There is that and the fact that I Hate static cling, just the way fabric feels like it is trying to touch me makes my skin crawl. So I also hate clingy fabric. This cuts down on my fabric choices immensely, but it doesn't bother me. 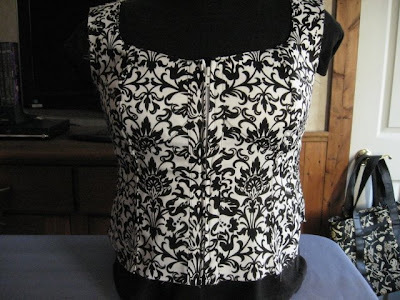 The Burda Corset is a pretty pattern, princess lines, zippered closure, piped seams, long flowy sleeves. I have sewn it 4 times now, 3 muslins and then one to actually wear. There were issues with general fit, sway back alterations, raised neckline (who do they think I'm trying to impress?? and with what?? ), wierd cup sizes (I think they hijacked those pattern pieces from some old timey football helmet) as well as the usual Burda crappy instructions. With most patterns - this one included - I read all the way through the instructions, I stare at the pictures and think, 'uhh wha? Why do I do that? That makes no sense, that is slow' etc, etc (and there is usually cursing). So I put the instructions away. And I made this. Does the fabric look familiar? It is the stretch cotton I fell back in love with while making my mom's bag. I found it to be sturdy enough to make it unlined, which would have created a problem with the piped seams if I had chosen to make them, but I didn't. My option, and a much nicer option on this fabric was flat-felled seams like those found on jeans. They are really easy to do and make a nice clean seam because all the raw edges are enclosed (I'm all about clean seams). 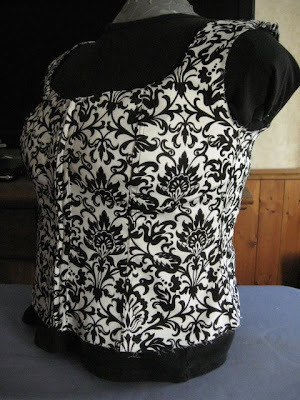 Each bust piece was sewn to the front bodice first using just a regular seam. All of the bust was lined so the raw edges were hidden inside there. All horizontal seams were just plain seams. All the vertical seams were flat-felled seams. It worked out just the way I anticipated. The little bit of stretch in this cotton makes it form fitting without feeling restrictive, I am so loving this cotton! This top is so comfortable to wear, the fact that this pattern was compulsively altered may have something to do with the fit. There were two options for sleeves on the pattern, short or long belled sleeves. The short looked too casual and the long looked too princessy, plus in this fabric long sleeves would have given it a very short wearable season. I opted for sleeveless with the rationale that a tight long-sleeved shirt can be worn under it in the fall/winter and can be worn on it's own in the warmer months. The only worry for this shirt is the length. In the picture it looked short, but I didn't bother to add any length to it. I'm only 5 feet tall and they were showing it on a tall, thin model so surely it would be longer on me. Well, in some mystical pattern drafting twist of fate this shirt is so short that if I hem it, this poor shirt will become a bellytop....umm no. I need to finish the edge with bias tape so I don't lose any of the length. 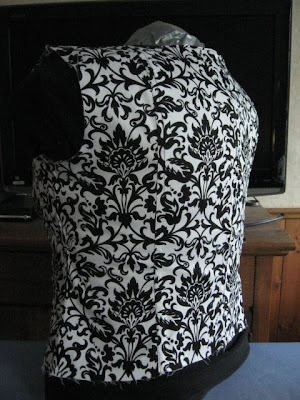 Next up on the sewing list is another revamp of this pattern. 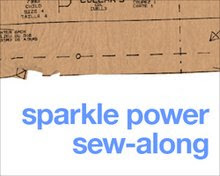 I'm going to draft it into a dress using some black and white polka dot stretch cotton. It's going to be great! ok - that is just too cool! I have got to get to it and make some clothes!